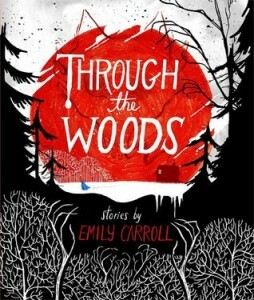 For my most recent, fifth book group, Beer + Comix held at Wild Rumpus bookstore in the Twin Cities, I read Through the Woods by Emily Carroll a graphic novel collection of short story/fable-type things. Carroll’s work reminded me strongly of Angela Carter’s reimagined, feminist retelling of old fairy tales. They felt hauntingly familiar even though they are Carroll’s own work. The art and interplay with text were lovely to read. The collection has four stories with young women as main characters. The central story is “His Face All Red” which is available online. The stories made for a good discussion, as they are open to interpretation, and all the spookier for it. This entry was posted on Thursday, October 30th, 2014 at 10:37 am	and is filed under 2014 Books, comic books. You can follow any responses to this entry through the RSS 2.0 feed. Both comments and pings are currently closed.